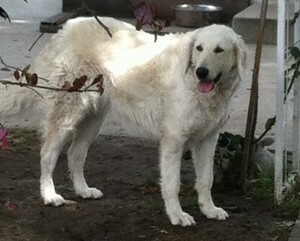 Adoption | Kuvasz Fanciers of America, Inc.
Rosie is a 6 year old spayed female that must be rehomed due to her owner having to downsize. She is housebroken and up to date on shots. She loves children of all ages. She would do well in a home with no other dogs, or another large male dog. NO CATS! She has lived all her life as an indoor/outdoor dog, sleeping inside at nights. She was bred by Santa’s Forest/Sally Fergusen. 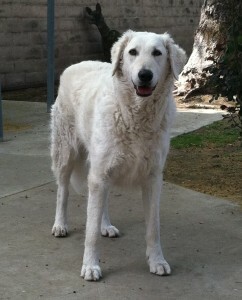 Rosie is located in the Southern California area. Transport to nearby states should not be a problem.